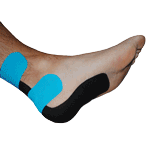 We have products that are custom designed to treat specific areas of your ankle. It doesn't matter if your injury is in the front, sides or back of your ankle - we have the products you need to stop the pain and accelerate healing. Whether your issue is a sprain, tendonitis, or something more serious like a tear, these are the products that you need. If your injury is located in the front or sides of your ankle, you need our BFST® and ColdCure® Ankle Wraps. These devices are designed to treat Ankle Sprains, Peroneal Tendonitis, Tibialis Anterior Tendonitis, Extensor Tendonitis and Ankle Pain. Normally, this is a very difficult area to treat due to the shape and location, but our Ankle Wraps do an exceptional job of targeting the top of the foot and both sides of the ankle. These two products are everything you need to relieve the pain and heal your ankle. This is a complete treatment that will carry you all the way from the initial injury to months after you've finished healing. And you'll be pleasantly surprised at how much faster your recovery can be. I love these wraps! I think they are the greatest thing in the world! Greatest thing since sliced bread. They are the best things I have ever found and are are just so easy to use. I have already noticed some progress. Thank you. The BFST® and ColdCure® Achilles Wraps are exactly what you need to treat your Achilles Tendonitis, Achilles Tendon Tears, Achilles Paratenonitis, Achilles Tendonosis and Achilles Tenosynovitis. They're ideal for any injuries or conditions in the back of your ankle. These devices wrap up and down the entire back of your ankle for maximum coverage of your Achilles Tendon. Because of the special design of these wraps, they get in all the areas a generic wrap just can't. These two devices cover pain and swelling relief, healing of the injury itself, as well as re-injury prevention. You can't find this technology anywhere else. It's unique to King Brand®. You'll be amazed at how quickly you can heal and feel better. It's absolutely fantastic. I ruptured my Achilles tendon a few months ago and just in the physiotherapy phase now and and get a bit of swelling and this wrap is perfect. It's really really helpful and works beautifully! KB Support Tape is the ultimate accessory to your BFST® and ColdCure® Wraps. 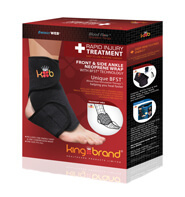 Use it between treatments with the Wraps or anytime your ankle needs extra support and protection. This is what will help you avoid re-injury during the recovery process, and this contributes to a much faster recovery time. This is especially important during physical activity. 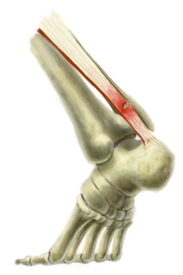 The above image shows an example of a tape application for Achilles Tendonitis. We encourage you to look into various applications for your ankle injury to find the one that works best for you. Applications will differ depending on the area of your ankle that's injured and what type of ankle injury it is. There are plenty of examples online. 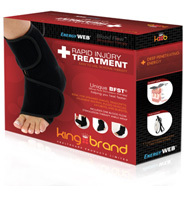 Every BFST® and ColdCure® Wrap purchase comes with the additional benefit of having one of our knowledgeable King Brand® Advisors contact you 3 or 4 days after your order has been delivered. This is to find out how your treatments are going and answer any questions you may have. Our Advisors have been thoroughly trained on BFST® and ColdCure® technology and treatments, as well as various Ankle injuries and conditions. 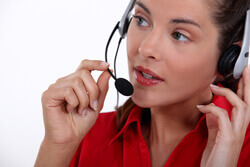 Our Advisors spend all day every day giving people treatment advice and guidance. They truly care about your recovery. While one of our Advisors will follow-up with you directly, you are welcome to contact us. We are here to help you every step of the way. Your recovery is very important to us. Note from KB WebMaster - The text below is primarily intended to assist with Google properly classifying this page content. 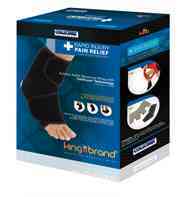 To learn more about our products please visit our website.<br>Ankle injuries plague many people. A bad ankle injury causes ankle pain. There are many symptoms of ankle pain caused by ankle injuries. Treatment for a ankle injury will cause your ankle pain to improve and your ankle injury to heal. There's no doubt that to heal ankle injuries quickly you need BFST treatments. Coldcure will help with ankle pain. You can cure ankle pain and a ankle injury with BFST and coldcure technology. Some ankle injuries require surgery. This heals the injured ankle but the pain in your ankle after surgery can be severe. The best ankle injury treatment is BFST. The best ankle pain treatment is coldcure. These wraps are incredible. They feel comfortable. They work. So, if you want to heal your injured ankle quickly, you need BFST. If you want to treat ankle pain you need coldcure. ankle injury symptoms are ankle pain and swelling. A sore ankle can be helped with ankle exercises although ankle exercises won't cure all ankle injuries.